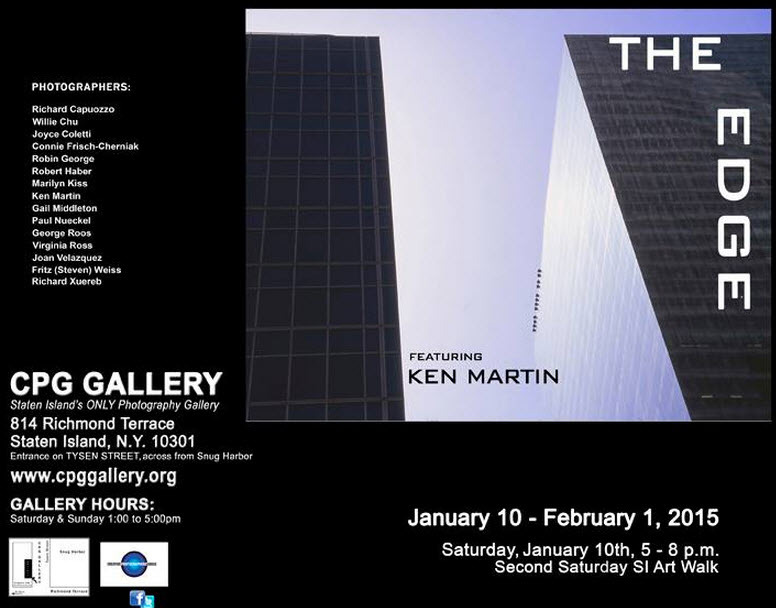 CPG’s (Creative Photographers Guild) first show of the new year, featuring member photographer Ken Martin. The Creative Photographers Guild is a 501(C)(3) non-profit organization of photographers, from novice to professional, whose mission is to bring the universally expressive power of photography to the community. The Guild also aims to provide a vibrant avenue for the promotion and appreciation of the creative and innovative world of photography to the greater New York community, especially Staten Island. In service of those goals, the Guild opened the CPG Gallery in March of 2009 on Staten Island’s arts-oriented North Shore. Members also seek other venues in which to exhibit photographs, promote public awareness of the unique artistic qualities of photography, support other artists and arts projects, and share skills and information with the community at large. All are encouraged to visit the gallery and speak with the photographers, one of whom is always on hand for discussions.